Jon Norton for WGLT, December 18, 2018. "...as always with this intelligently programmed festival – which will run Sept. 29-30 at multiple Hyde Park locations – underlying themes and messages will drive the proceedings. “With this year’s festival, I continued to think about young people,” says Kate Dumbleton, the event’s artistic director, who with her colleagues on the festival’s programming committee indeed has cast a spotlight on rising musicians from Chicago and beyond. Thaddeus Tukes with pianist Alexis Lombre, bassist Hannah Marks’ Heartland Trio, saxophonist Lenard Simpson’s Trio, saxophonist Jenna Przybysz’s Quartet and pianist Julius Tucker’s Trio (all on Sept. 29) are up-and-coming artists stepping to the fore." "I think the most important thing to me about IU and what attracted me to the school is the professors and how accessible the professors are...This school and the community is so all-encompassing, on every side and every aspect of being a professional musician that I know I'm going to leave this school and be ready to get out there and play." 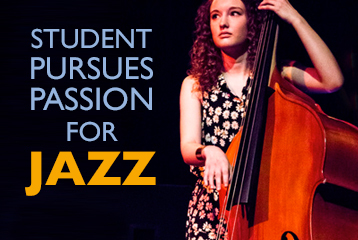 "The Brubeck Summer Jazz Colony is a one-week, intensive educational program in jazz performance for a very limited number of exceptionally talented students...Hannah was one of only four bass players accepted into the program. Applicants were from the United States, Australia, and the UK...According to Roosevelt orchestra director Jennifer Luft, what makes her selection to the prestigious camp all the more impressive is that, until recently, she was a cello player. Hannah has played upright bass for just one year and studies with Steve Charlson and Dave Altemeier. “She is one amazing young woman,” notes Luft." "The most rewarding thing about being a Jacobs student is that many of my fellow students have become my close friends and collaborators. I love playing in rigorous school ensembles and in high-level groups led by my professors, but it’s also fun to relax and jam with my friends in our spare time....Being a music major is a lot of hard work, and it can be very stressful. However, I know that taking required jazz and classical music courses, exploring other genres, and playing with mentors and friends are all tools to becoming the best musician I can be. The Jacobs School of Music is overflowing with talented musicians, and, as it always has been, it’s up to me to find my own path by following all my interests." "The most important thing I learned at camp was that there are kids my age even more passionate than I am about jazz. Seeing this gave me hope for my future in college—that I will find kindred spirits who will challenge me as a player—and I started setting bigger goals for myself. Realizing that some kids attend performing arts high schools where the bulk of their time is spent in rehearsal and performance, I pushed myself to take charge of my jazz education. I knew I needed to create opportunities for myself...Like any jazz musician, I know how important it is to be able to improvise, to take cues from other players in a combo, and to build off their sound. When it’s my turn to play a solo, I must often take a risk and compose as I go, listening to the people I play with in order to produce a coherent sound. Although I take jazz band as one of my high school classes, my real education in jazz has come from my involvement in the music scene, both locally and nationally. By taking risks and connecting with the other musicians around me, I have improvised my own jazz education."